The crunchy Anzac biscuit was first baked by women on the Australian and New Zealand home fronts and sent across the sea to their soldiers. Originally named “Soldiers’ Biscuits” and containing just flour, sugar, milk powder and water, these simple biscuits were made to endure the journey at sea. It is said that the women back at home in WWI wanted to make biscuits for the men at war, as they were concerned they weren’t eating well. But as the country was on rations, the women had to make them without eggs. 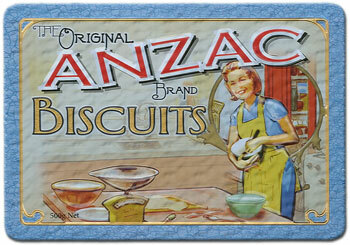 Anzac biscuits were said to provide great sustenance for soldiers fighting in the trenches. The ANZACs (Australian and New Zealand Army Corps) were soldiers serving in Gallipoli during WWI. The term originated at that time, but is now used as a general term for Australian and New Zealand soldiers. ANZAC Day is a national holiday in Australia and New Zealand celebrated annually on April 25. It is a joint public holiday to commemorate the Gallipoli landings during WWI It also commemorates all who’ve died in war fighting for the two countries. All Australians know and love Anzac biscuits. Today the biscuits are more of a treat with the addition of butter, golden syrup and desiccated coconut. Now the well-loved biscuits are eaten all year round in Australia and New Zealand, and are often described to visitors as being a traditional food. In Australia and New Zealand cookies are called “biscuits.” The word Anzac is a protected phrase, and can’t be used freely. The authorities in Australia have granted an exception for Anzac biscuits, on the proviso they are never marketed as Anzac cookies, only biscuits. Enjoy this special Aussie treat. Coconut and chocolate—ambrosia of the gods.